A comprehensive guide to installing Red Hat Virtualization. The installation and configuration of a Red Hat Virtualization Manager. The installation and configuration of hosts. Attach existing FCP storage to your Red Hat Virtualization environment. More storage options can be found in the Administration Guide. Red Hat Virtualization Manager A server that manages and provides access to the resources in the environment. Hosts Hosts are servers that provide the processing capabilities and memory resources used to run virtual machines. Storage Storage is used to store the data associated with virtual machines. It is important to synchronize the system clocks of the hosts, Manager, and other servers in the environment to avoid potential timing or authentication issues. To do this, configure the Network Time Protocol (NTP) on each system to synchronize with the same NTP server. Hardware certification for Red Hat Virtualization is covered by the hardware certification for Red Hat Enterprise Linux. For more information, see https://access.redhat.com/solutions/725243. The minimum and recommended hardware requirements outlined here are based on a typical small to medium sized installation. The exact requirements vary between deployments based on sizing and load. The Red Hat Virtualization Manager runs on Red Hat Enterprise Linux. To confirm whether or not specific hardware items are certified for use with Red Hat Enterprise Linux, see https://access.redhat.com/ecosystem/#certifiedHardware. CPU A dual core CPU. A quad core CPU or multiple dual core CPUs. Memory 4 GB of available system RAM if Data Warehouse is not installed and if memory is not being consumed by existing processes. 16 GB of system RAM. Hard Disk 25 GB of locally accessible, writable, disk space. 50 GB of locally accessible, writable, disk space. You can use the RHEV Manager History Database Size Calculator to calculate the appropriate disk space to have for the Manager history database size. Network Interface 1 Network Interface Card (NIC) with bandwidth of at least 1 Gbps. 1 Network Interface Card (NIC) with bandwidth of at least 1 Gbps. The following browser versions and operating systems can be used to access the Administration Portal and the User Portal. Tier 1: Browser and operating system combinations that are fully tested and fully supported. Red Hat Engineering is committed to fixing issues with browsers on this tier. Tier 2: Browser and operating system combinations that are partially tested, and are likely to work. Limited support is provided for this tier. Red Hat Engineering will attempt to fix issues with browsers on this tier. Tier 3: Browser and operating system combinations that are not tested, but may work. Minimal support is provided for this tier. Red Hat Engineering will attempt to fix only minor issues with browsers on this tier. Virtual machine consoles can only be accessed using supported Remote Viewer (virt-viewer) clients on Red Hat Enterprise Linux and Windows. To install virt-viewer, see Installing Supported Components in the Virtual Machine Management Guide. Installing virt-viewer requires Administrator privileges. SPICE console access is only available on other operating systems, such as OS X, through the unsupported SPICE HTML5 browser client. Supported QXL drivers are available on Red Hat Enterprise Linux, Windows XP, and Windows 7. Tier 1: Operating systems on which remote-viewer has been fully tested and is supported. Tier 2: Operating systems on which remote-viewer is partially tested and is likely to work. Limited support is provided for this tier. Red Hat Engineering will attempt to fix issues with remote-viewer on this tier. The Red Hat Virtualization Manager must be installed on a base installation of Red Hat Enterprise Linux 7 that has been updated to the latest minor release. Do not install any additional packages after the base installation because they may cause dependency issues when attempting to install the packages required by the Manager. The Red Hat Virtualization Manager and all network communication requires reverse DNS lookup and the existence of a PTR record to avoid significant performance degredation. An entry in the /etc/hosts file is not sufficient because it does not provide reverse DNS lookup. All CPUs must have support for the Intel® 64 or AMD64 CPU extensions, and the AMD-V™ or Intel VT® hardware virtualization extensions enabled. Support for the No eXecute flag (NX) is also required. You must enable Virtualization in the BIOS. Power off and reboot the host after this change to ensure that the change is applied. At the Red Hat Enterprise Linux or Red Hat Virtualization Host boot screen, press any key and select the Boot or Boot with serial console entry from the list. Press Tab to edit the kernel parameters for the selected option. Ensure there is a Space after the last kernel parameter listed, and append the rescue parameter. Press Enter to boot into rescue mode. If any output is shown, then the processor is hardware virtualization capable. If no output is shown, then it is still possible that your processor supports hardware virtualization. In some circumstances manufacturers disable the virtualization extensions in the BIOS. If you believe this to be the case, consult the system's BIOS and the motherboard manual provided by the manufacturer. The amount of RAM required varies depending on guest operating system requirements, guest application requirements, and memory activity and usage of guests. You also need to take into account that KVM is able to overcommit physical RAM for virtualized guests. This allows for provisioning of guests with RAM requirements greater than what is physically present, on the basis that the guests are not all concurrently at peak load. KVM does this by only allocating RAM for guests as required and shifting underutilized guests into swap. Hosts require local storage to store configuration, logs, kernel dumps, and for use as swap space. The minimum storage requirements of Red Hat Virtualization Host are documented in this section. The storage requirements for Red Hat Enterprise Linux hosts vary based on the amount of disk space used by their existing configuration but are expected to be greater than those of Red Hat Virtualization Host. If you are also installing the RHV-M Virtual Appliance for self-hosted engine installation, the /var partition must be at least 60 GB. For the recommended swap size, see https://access.redhat.com/solutions/15244. Hosts must have at least one network interface with a minimum bandwidth of 1 Gbps. It is recommended that each host have two network interfaces with one dedicated to support network intensive activities such as virtual machine migration. The performance of such operations are limited by the bandwidth available. CPU must support IOMMU (for example, VT-d or AMD-Vi). IBM POWER8 supports IOMMU by default. CPU root ports used must support ACS or ACS-equivalent capability. PCIe device must support ACS or ACS-equivalent capability. It is recommended that all PCIe switches and bridges between the PCIe device and the root port should support ACS. For example, if a switch does not support ACS, all devices behind that switch share the same IOMMU group, and can only be assigned to the same virtual machine. For GPU support, Red Hat Enterprise Linux 7 supports PCI device assignment of NVIDIA K-Series Quadro (model 2000 series or higher), GRID, and Tesla as non-VGA graphics devices. Currently up to two GPUs may be attached to a virtual machine in addition to one of the standard, emulated VGA interfaces. The emulated VGA is used for pre-boot and installation and the NVIDIA GPU takes over when the NVIDIA graphics drivers are loaded. Note that the NVIDIA Quadro 2000 is not supported, nor is the Quadro K420 card. Refer to vendor specification and datasheets to confirm that hardware meets these requirements. After you have installed a host, see Appendix G, Configuring a Host for PCI Passthrough for more information on how to enable the host hardware and software for device passthrough. To implement SR-IOV, see https://access.redhat.com/documentation/en/red-hat-virtualization/4.0/single/hardware-considerations-for-implementing-sr-iov/ for more information. The lspci -v command can be used to print information for PCI devices already installed on a system. The Red Hat Virtualization Manager requires that a number of ports be opened to allow network traffic through the system's firewall. The engine-setup script can configure the firewall automatically, but this overwrites any pre-existing firewall configuration. Where an existing firewall configuration exists, you must manually insert the firewall rules required by the Manager instead. The engine-setup command saves a list of the iptables rules required in the /usr/share/ovirt-engine/conf/iptables.example file. The firewall configuration documented here assumes a default configuration. Where non-default HTTP and HTTPS ports are chosen during installation, adjust the firewall rules to allow network traffic on the ports that were selected - not the default ports (80 and 443) listed here. When registering to the Red Hat Virtualization Manager, virtualization hosts send an ICMP ping request to the Manager to confirm that it is online. System(s) used for maintenance of the Manager including backend configuration, and software upgrades. Clients accessing virtual machine serial consoles. Secure Shell (SSH) access to enable connection to virtual machine serial consoles. Provides HTTP and HTTPS access to the Manager. Provides websocket proxy access for web-based console clients (noVNC and spice-html5) when the websocket proxy is running on the Manager. If the websocket proxy is running on a different host, however, this port is not used. Must be open for the Manager to receive Kdump notifications. TCP port 2049 for NFS. TCP and UDP port 2049 for NFS. TCP and UDP port 111 (rpcbind/sunrpc). TCP and UDP port specified with MOUNTD_PORT="port"
TCP and UDP port specified with STATD_PORT="port"
TCP port specified with LOCKD_TCPPORT="port"
UDP port specified with LOCKD_UDPPORT="port"
The MOUNTD_PORT, STATD_PORT, LOCKD_TCPPORT, and LOCKD_UDPPORT ports are configured in the /etc/sysconfig/nfs file. Red Hat Enterprise Linux hosts and Red Hat Virtualization Hosts (RHVH) require a number of ports to be opened to allow network traffic through the system's firewall. In the case of the Red Hat Virtualization Host these firewall rules are configured automatically. For Red Hat Enterprise Linux hosts however it is necessary to manually configure the firewall. Simple network management protocol (SNMP). Only required if you want Simple Network Management Protocol traps sent from the host to one or more external SNMP managers. 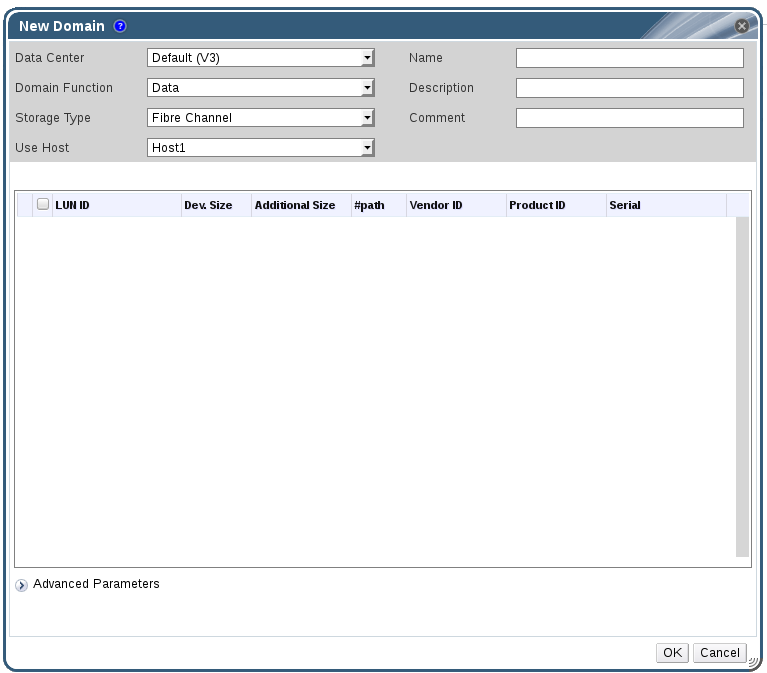 Remote guest console access via VNC and SPICE. These ports must be open to facilitate client access to virtual machines. Used by Common Information Model Object Managers (CIMOM) to monitor virtual machines running on the host. Only required if you want to use a CIMOM to monitor the virtual machines in your virtualization environment. Virtual machine migration using libvirt. Virtual machine migration and fencing using VDSM. These ports must be open facilitate both automated and manually initiated migration of virtual machines. VDSM communications with the Manager and other virtualization hosts. Red Hat Virtualization requires a directory server to support user authentication. A number of ports must be opened in the directory server's firewall to support GSS-API authentication as used by the Red Hat Virtualization Manager. Lightweight Directory Access Protocol (LDAP) and LDAP over SSL. Red Hat Virtualization supports the use of a remote database server. If you plan to use a remote database server with Red Hat Virtualization then you must ensure that the remote database server allows connections from the Manager. Default port for PostgreSQL database connections. If you plan to use a local database server on the Manager itself, which is the default option provided during installation, then no additional firewall rules are required. Once you have installed a Red Hat Enterprise Linux base operating system and made sure the system meets the requirements listed in the previous chapter, you must register the system with Red Hat Subscription Manager, and subscribe to the required entitlements to install the Red Hat Virtualization Manager packages. Find the Red Hat Enterprise Linux Server and Red Hat Virtualization subscription pools and note down the pool IDs. You have now subscribed your system to the required entitlements. Proceed to the next section to install the Red Hat Virtualization Manager packages. Before you can configure and use the Red Hat Virtualization Manager, you must install the rhevm package and dependencies. Reboot the machine if any kernel related packages have been updated. Run the following command to install the rhevm package and dependencies. Proceed to the next step to configure your Red Hat Virtualization Manager. After you have installed the rhevm package and dependencies, you must configure the Red Hat Virtualization Manager using the engine-setup command. This command asks you a series of questions and, after you provide the required values for all questions, applies that configuration and starts the ovirt-engine service. By default, engine-setup creates and configures the Manager database locally on the Manager machine. Alternatively, you can configure the Manager to use a remote database or a manually-configured local database; however, you must set up that database before running engine-setup. To set up a remote database see Appendix D, Preparing a Remote PostgreSQL Database for Use with the Red Hat Virtualization Manager. To set up a manually-configured local database, see Appendix E, Preparing a Local Manually-Configured PostgreSQL Database for Use with the Red Hat Virtualization Manager. By default, engine-setup will configure a websocket proxy on the Manager. However, for security and performance reasons, the user can choose to configure it on a separate host. See Appendix F, Installing a Websocket Proxy on a Separate Machine for instructions. The engine-setup command guides you through several distinct configuration stages, each comprising several steps that require user input. Suggested configuration defaults are provided in square brackets; if the suggested value is acceptable for a given step, press Enter to accept that value. Optionally allow engine-setup to configure the Image I/O Proxy to allow the Manager to upload virtual disk images into storage domains. See Uploading a Disk Image to a Storage Domain in the Administration Guide for more information. To configure the websocket proxy on a separate machine, select No and refer to Appendix F, Installing a Websocket Proxy on a Separate Machine for configuration instructions. Choose whether to configure Data Warehouse on the Manager machine. To configure Data Warehouse on a separate machine, select No and see Installing and Configuring Data Warehouse on a Separate Machine in the Data Warehouse Guide for installation and configuration instructions. Additional configuration is required on the client machine to use this feature. See Opening a Serial Console to a Virtual Machine in the Virtual Machine Management Guide. The engine-setup command checks your firewall configuration and offers to modify that configuration to open the ports used by the Manager for external communication such as TCP ports 80 and 443. If you do not allow engine-setup to modify your firewall configuration, then you must manually open the ports used by the Manager. engine-setup requests these values after the Manager database is configured in the next step. The example above allows access to a single /24 network and two specific hosts. See the exports(5) man page for further formatting options. This step is skipped if you chose not to configure Data Warehouse on the Manager machine. Basic reduces the values of DWH_TABLES_KEEP_HOURLY to 720 and DWH_TABLES_KEEP_DAILY to 0, easing the load on the Manager machine (recommended when the Manager and Data Warehouse are installed on the same machine). If you intend to link your Red Hat Virtualization environment with a directory server, configure the date and time to synchronize with the system clock used by the directory server to avoid unexpected account expiry issues. See Synchronizing the System Clock with a Remote Server in the Red Hat Enterprise Linux System Administrator's Guide for more information. When your environment has been configured, engine-setup displays details about how to access your environment. If you chose to manually configure the firewall, engine-setup provides a custom list of ports that need to be opened, based on the options selected during setup. The engine-setup command also saves your answers to a file that can be used to reconfigure the Manager using the same values, and outputs the location of the log file for the Red Hat Virtualization Manager configuration process. The first time that you connect to the Administration Portal, you are prompted to trust the certificate being used to secure communications between your browser and the web server. You must accept this certificate. Refer to the instructions to install the certificate authority in Firefox, Internet Explorer, or Google Chrome. Click Administration Portal. An SSO login page displays. SSO login enables you to log in to the Administration and User Portals at the same time. To log out of the Red Hat Virtualization Administration Portal, click your user name in the header bar and click Sign Out. You are logged out of all portals and the Manager welcome screen displays. The next chapter contains additional Manager related tasks which are optional. If the tasks are not applicable to your environment, proceed to Part III, “Installing Hosts”. You can use the engine-cleanup command to remove specific components or all components of the Red Hat Virtualization Manager. A backup of the engine database and a compressed archive of the PKI keys and configuration are always automatically created. These files are saved under /var/lib/ovirt-engine/backups/, and include the date and engine- and engine-pki- in their file names respectively. You are given another opportunity to change your mind and cancel the removal of the Red Hat Virtualization Manager. If you choose to proceed, the ovirt-engine service is stopped, and your environment's configuration is removed in accordance with the options you selected. To install Red Hat Virtualization Manager on a system that does not have a direct connection to the Content Delivery Network, download the required packages on a system that has Internet access, then create a repository that can be shared with the offline Manager machine. The system hosting the repository must be connected to the same network as the client systems where the packages are to be installed. Install Red Hat Enterprise Linux 7 Server on a system that has access to the Content Delivery Network. This system downloads all the required packages, and distributes them to your offline system(s). Ensure that the system used in this procedure has a large amount of free disk space available. This procedure downloads a large number of packages, and requires up to 50GB of free disk space. This command downloads a large number of packages, and takes a long time to complete. The -l option enables yum plug-in support. Create a repository file, and copy it to the /etc/yum.repos.d/ directory on the offline machine on which you will install the Manager. Install the Manager packages on the offline system. See Section 3.2, “Installing the Red Hat Virtualization Manager Packages” for instructions. Packages are installed from the local repository, instead of from the Content Delivery Network. Configure the Manager. See Section 3.3, “Configuring the Red Hat Virtualization Manager” for initial configuration instructions. Continue with host, storage, and virtual machine configuration. Red Hat Virtualization supports two types of hosts: Red Hat Virtualization Host (RHVH) and Red Hat Enterprise Linux host. Depending on your environment requirement, you may want to use one type only or both in your Red Hat Virtualization environment. It is recommended that you install and attach at least two hosts to the Red Hat Virtualization environment. Where you attach only one host you will be unable to access features such as migration and high availability. SELinux is in enforcing mode upon installation. To verify, run getenforce. SELinux is required to be in enforcing mode on all hypervisors and Managers for your Red Hat Virtualization environment to be supported by Red Hat. This is a minimal operating system based on Red Hat Enterprise Linux. It is distributed as an ISO file from the Customer Portal and contains only the packages required for the machine to act as a host. Red Hat Enterprise Linux hosts subscribed to the appropriate channels can be used as hosts. When you create a new data center, you can set the compatibility version. Select the compatibility version that suits all the hosts in the data center. Once set, version regression is not allowed. For a fresh Red Hat Virtualization installation, the latest compatibility version is set in the default data center and default cluster; to use an older compatibility version, you must create additional data centers and clusters. For more information about compatibility versions see Red Hat Virtualization Manager Compatibility in the Red Hat Virtualization Life Cycle. Red Hat Virtualization 4.0 introduces an upgraded version of the Red Hat Enterprise Virtualization Hypervisor. While the previous RHEV-H was a closed system with a basic text user interface for installation and configuration, Red Hat Virtualization Host (RHVH) can be updated via yum and uses an Anaconda installation interface based on the one used by Red Hat Enterprise Linux hosts. Before you proceed, make sure the machine on which you are installing RHVH meets the hardware requirements listed in Section 2.2, “Hypervisor Requirements”. Start the machine on which to install RHVH using the prepared installation media. From the boot menu, select the Install option, and press Enter. Red Hat strongly recommends using the Automatically configure partitioning option. For information on preserving local storage domains when reinstalling RHVH, see Upgrading to RHVH While Preserving Local Storage in the Upgrade Guide. Select a network from the Network & Host Name screen and click Configure... to configure the connection details. Enter a host name in the Host name field, and click Done. When RHVH restarts, imgbase-motd.service performs a health check on the host and displays the result when you log in on the command line. The message imgbase status: OK or imgbase status: DEGRADED indicates the health status. Run imgbase check to get more information. The service is enabled by default. Once the installation is complete, log in to the Cockpit user interface at https://HostFQDNorIP:9090 to subscribe the host to the Content Delivery Network. Click Tools > Subscriptions > Register System and enter your Customer Portal username and password. The system automatically subscribes to the Red Hat Virtualization Host entitlement. You can now add the host to your Red Hat Virtualization environment. See Chapter 8, Adding a Host to the Red Hat Virtualization Manager. Configuring networking through NetworkManager (including nmcli, nmtui, and the Cockpit user interface) is currently not supported. If additional network configuration is required before adding a host to the Manager, you must manually write ifcfg files. See the Red Hat Enterprise Linux Networking Guide for more information. Custom partitioning on Red Hat Virtualization Host (RHVH) is not recommended. Red Hat strongly recommends using the Automatically configure partitioning option in the Installation Destination window. You must select the LVM Thin Provisioning option in the Manual Partitioning window. The root (/) directory must be on a thinly provisioned logical volume. The root (/) directory must be at least 6 GB. The /var directory must be on a separate volume or disk. Only XFS or Ext4 file systems are supported. You can install Red Hat Virtualization Host (RHVH) without a physical media device by booting from the network using PXE. You can automate the installation process by using a Kickstart file containing the answers to the installation questions. The Kickstart file can also be accessed over the network, removing the need for physical media. Instructions for both tasks can be found in the Red Hat Enterprise Linux 7 Installation Guide, as RHVH is installed in much the same way as Red Hat Enterprise Linux. The main differences required for RHVH are included in the following procedure. Make the RHVH ISO image available over the network using the instructions in Installation Source on a Network. Configure the PXE server using the instructions in Preparing for a Network Installation. Ensure that you copy the RHVH boot images to the tftp/ root directory. The boot loader configuration file must include a RHVH label that specifies the RHVH boot images. Create a Kickstart file and make it available over the network using the instructions in Kickstart Installations. The %packages section is not required for RHVH. Instead, use the liveimg option and specify the squashfs.img file from the RHVH ISO image. The autopart command is highly recommended. Thin provisioning must be used. The /var directory must be on a separate volume. The /boot directory must be on a separate partition. A %post section that calls the nodectl init command is required. The following is an example of a Kickstart file used to deploy Red Hat Virtualization Host. You can include additional commands and options as required. Install RHVH using the instructions in Booting the Installation on AMD64 and Intel 64 Systems from the Network Using PXE. A Red Hat Enterprise Linux host, also known as a RHEL-based hypervisor is based on a standard basic installation of Red Hat Enterprise Linux on a physical server, with Red Hat Enterprise Linux Server and the Red Hat Virtualization entitlements enabled. For detailed installation instructions, see Red Hat Enterprise Linux 7 Installation Guide. See Appendix G, Configuring a Host for PCI Passthrough for more information on how to enable the host hardware and software for device passthrough. Virtualization must be enabled in your host's BIOS settings. For information on changing your host's BIOS settings, refer to your host's hardware documentation. Third-party watchdogs should not be installed on Red Hat Enterprise Linux hosts, as they can interfere with the watchdog daemon provided by VDSM. To be used as a virtualization host, make sure the Red Hat Enterprise Linux host meets the hardware requirements listed in Section 2.2, “Hypervisor Requirements”. The host must also be registered and subscribed to a number of entitlements using Subscription Manager. Follow this procedure to register with the Content Delivery Network and attach the Red Hat Enterprise Linux Server and Red Hat Virtualization entitlements to the host. Once you have subscribed the host to the required entitlements, proceed to the next section to attach your host to your Red Hat Virtualization environment. Configuring networking through NetworkManager (including nmcli and nmtui) is currently not supported. If additional network configuration is required before adding a host to the Manager, you must manually write ifcfg files. See the Red Hat Enterprise Linux Networking Guide for more information. Adding a host to your Red Hat Virtualization environment can take some time, as the following steps are completed by the platform: virtualization checks, installation of packages, creation of bridge, and a reboot of the host. Use the details pane to monitor the process as the host and the Manager establish a connection. From the Administration Portal, click the Hosts resource tab. Use the drop-down list to select the Data Center and Host Cluster for the new host. Enter the Name and the Address of the new host. The standard SSH port, port 22, is auto-filled in the SSH Port field. Select an authentication method to use for the Manager to access the host. Enter the root user's password to use password authentication. Alternatively, copy the key displayed in the SSH PublicKey field to /root/.ssh/authorized_keys on the host to use public key authentication. Click the Advanced Parameters button to expand the advanced host settings. Optionally disable automatic firewall configuration. Optionally add a host SSH fingerprint to increase security. You can add it manually, or fetch it automatically. Optionally configure power management, where the host has a supported power management card. For information on power management configuration, see Host Power Management Settings Explained in the Administration Guide. The new host displays in the list of hosts with a status of Installing, and you can view the progress of the installation in the details pane. After a brief delay the host status changes to Up. A storage domain is a collection of images that have a common storage interface. A storage domain contains complete images of templates and virtual machines (including snapshots), ISO files, and metadata about themselves. A storage domain can be made of either block devices (SAN - iSCSI or FCP) or a file system (NAS - NFS, GlusterFS, or other POSIX compliant file systems). Data Domain: A data domain holds the virtual hard disks and OVF files of all the virtual machines and templates in a data center, and cannot be shared across data centers. Data domains of multiple types (iSCSI, NFS, FC, POSIX, and Gluster) can be added to the same data center, provided they are all shared, rather than local, domains. You must have one host with the status of Up and have attached a data domain to a data center before you can attach an ISO domain and an export domain. ISO Domain: ISO domains store ISO files (or logical CDs) used to install and boot operating systems and applications for the virtual machines, and can be shared across different data centers. An ISO domain removes the data center's need for physical media. ISO domains can only be NFS-based. Only one ISO domain can be added to a data center. Export Domain: Export domains are temporary storage repositories that are used to copy and move images between data centers and Red Hat Virtualization environments. Export domains can be used to backup virtual machines. An export domain can be moved between data centers, however, it can only be active in one data center at a time. Export domains can only be NFS-based. Only one export domain can be added to a data center. Red Hat Virtualization platform supports SAN storage by creating a storage domain from a volume group made of pre-existing LUNs. Neither volume groups nor LUNs can be attached to more than one storage domain at a time. Red Hat Virtualization system administrators need a working knowledge of Storage Area Networks (SAN) concepts. SAN usually uses Fibre Channel Protocol (FCP) for traffic between hosts and shared external storage. For this reason, SAN may occasionally be referred to as FCP storage. For information regarding the setup and configuration of FCP or multipathing on Red Hat Enterprise Linux, see the Storage Administration Guide and DM Multipath Guide. The following procedure shows you how to attach existing FCP storage to your Red Hat Virtualization environment as a data domain. For more information on other supported storage types, see Storage in the Administration Guide. Click the Storage resource tab to list all storage domains. Enter the Name of the storage domain. Use the Data Center drop-down menu to select an FCP data center. If you do not yet have an appropriate FCP data center, select (none). Use the drop-down menus to select the Domain Function and the Storage Type. The storage domain types that are not compatible with the chosen data center are not available. Select an active host in the Use Host field. If this is not the first data domain in a data center, you must select the data center's SPM host. All communication to the storage domain is through the selected host and not directly from the Red Hat Virtualization Manager. At least one active host must exist in the system and be attached to the chosen data center. All hosts must have access to the storage device before the storage domain can be configured. The New Domain window automatically displays known targets with unused LUNs when Data / Fibre Channel is selected as the storage type. Select the LUN ID check box to select all of the available LUNs. Click OK to create the storage domain and close the window. The new FCP data domain displays on the Storage tab. It will remain with a Locked status while it is being prepared for use. When ready, it is automatically attached to the data center. If the Manager was configured during setup to provide a local ISO domain, that domain can be attached to one or more data centers, and used to provide virtual machine image files. By default, the access control list (ACL) for the local ISO domain provides read and write access for only the Manager machine. Virtualization hosts require read and write access to the ISO domain in order to attach the domain to a data center. Use this procedure if network or host details were not available at the time of setup, or if you need to update the ACL at any time. While it is possible to allow read and write access to the entire network, it is recommended that you limit access to only those hosts and subnets that require it. Log in to the Manager machine. The example above allows read and write access to a single /24 network and two specific hosts. /var/lib/exports/iso is the default file path for the ISO domain. See the exports(5) man page for further formatting options. Note that if you manually edit the /etc/exports file after running engine-setup, running engine-cleanup later will not undo the changes. The local ISO domain, created during the Manager installation, appears in the Administration Portal as Unattached. To use it, attach it to a data center. The ISO domain must be of the same Storage Type as the data center. Each host in the data center must have read and write access to the ISO domain. In particular, ensure that the Storage Pool Manager has access. In the Administration Portal, click the Data Centers resource tab and select the appropriate data center. Select the Storage tab in the details pane to list the storage domains already attached to the data center. Click Attach ISO to open the Attach ISO Library window. Click the radio button for the local ISO domain. The ISO domain is now attached to the data center and is automatically activated. In the Navigation Pane, select the Clusters tab. 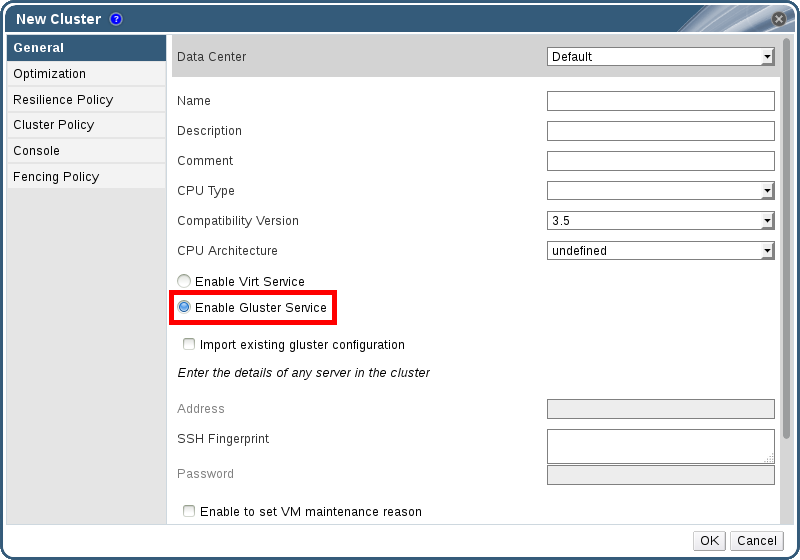 Select the "Enable Gluster Service" radio button. Provide the address, SSH fingerprint, and password as necessary. The address and password fields can be filled in only when the Import existing Gluster configuration check box is selected. It is now possible to add Red Hat Gluster Storage nodes to the Gluster cluster, and to mount Gluster volumes as storage domains. iptables rules no longer block storage domains from being added to the cluster. Optionally configure a PostgreSQL database on a remote Red Hat Enterprise Linux 7 machine to use as the Manager database. By default, the Red Hat Virtualization Manager's configuration script, engine-setup, creates and configures the Manager database locally on the Manager machine. For automatic database configuration, see Section 3.3, “Configuring the Red Hat Virtualization Manager”. To set up the Manager database with custom values on the Manager machine, see Appendix E, Preparing a Local Manually-Configured PostgreSQL Database for Use with the Red Hat Virtualization Manager. Use this procedure to configure the database on a machine that is separate from the machine where the Manager is installed. Set up this database before you configure the Manager; you must supply the database credentials during engine-setup. The engine-setup and engine-backup --mode=restore commands only support system error messages in the en_US.UTF8 locale, even if the system locale is different. The locale settings in the postgresql.conf file must be set to en_US.UTF8. The database name must contain only numbers, underscores, and lowercase letters. # su -l postgres -c "/usr/bin/initdb --locale=en_US.UTF8 --auth='ident' --pgdata=/var/lib/pgsql/data/"
This example configures the postgresql service to listen for connections on all interfaces. You can specify an interface by giving its IP address. Optionally, set up SSL to secure database connections using the instructions at http://www.postgresql.org/docs/9.2/static/ssl-tcp.html#SSL-FILE-USAGE. Optionally configure a local PostgreSQL database on the Manager machine to use as the Manager database. By default, the Red Hat Virtualization Manager's configuration script, engine-setup, creates and configures the Manager database locally on the Manager machine. For automatic database configuration, see Section 3.3, “Configuring the Red Hat Virtualization Manager”. To configure the Manager database on a machine that is separate from the machine where the Manager is installed, see Appendix D, Preparing a Remote PostgreSQL Database for Use with the Red Hat Virtualization Manager. Use this procedure to set up the Manager database with custom values. Set up this database before you configure the Manager; you must supply the database credentials during engine-setup. To set up the database, you must first install the rhevm package on the Manager machine; the postgresql-server package is installed as a dependency. Optionally, set up SSL to secure database connections using the instructions at http://www.postgresql.org/docs/8.4/static/ssl-tcp.html#SSL-FILE-USAGE. The websocket proxy allows users to connect to virtual machines via noVNC and SPICE HTML5 consoles. The noVNC client uses websockets to pass VNC data. However, the VNC server in QEMU does not provide websocket support, therefore a websocket proxy must be placed between the client and the VNC server. The proxy can run on any machine that has access to the network, including the the Manager machine. For security and performance reasons, users may want to configure the websocket proxy on a separate machine. SPICE HTML5 support is a Technology Preview feature. Technology Preview features are not fully supported under Red Hat Subscription Service Level Agreements (SLAs), may not be functionally complete, and are not intended for production use. However, these features provide early access to upcoming product innovations, enabling customers to test functionality and provide feedback during the development process. This section describes how to install and configure the websocket proxy on a separate machine that does not run the Manager. See Section 3.3, “Configuring the Red Hat Virtualization Manager” for instructions on how to configure the websocket proxy on the Manager. Run the engine-setup command to configure the websocket proxy. If the rhevm package has also been installed, choose No when asked to configure the engine on this host. Press Enter to allow engine-setup to configure a websocket proxy server on the machine. Press Enter to allow engine-setup to configure the firewall and open the ports required for external communication. If you do not allow engine-setup to modify your firewall configuration, then you must manually open the required ports. Enter the fully qualified DNS name of the Manager machine and press Enter. Press Enter to allow engine-setup to perform actions on the Manager machine, or press 2 to manually perform the actions. Setup will need to do some actions on the remote engine server. Either automatically, using ssh as root to access it, or you will be prompted to manually perform each such action. Press Enter to accept the default SSH port number, or enter the port number of the Manager machine. Enter the root password to log in to the Manager machine and press Enter. Select whether to review iptables rules if they differ from the current settings. Generated iptables rules are different from current ones. Press Enter to confirm the configuration settings. Instructions are provided to configure the Manager machine to use the configured websocket proxy. in order to enroll certs for this host and configure the engine about it. Log in to the Manager machine and execute the provided instructions. Enabling PCI passthrough allows a virtual machine to use a host device as if the device were directly attached to the virtual machine. To enable the PCI passthrough function, you need to enable virtualization extensions and the IOMMU function. The following procedure requires you to reboot the host. If the host is attached to the Manager already, ensure you place the host into maintenance mode before running the following procedure. Ensure that the host hardware meets the requirements for PCI device passthrough and assignment. See Section 2.2.4, “PCI Device Requirements” for more information. Enable the virtualization extension and IOMMU extension in the BIOS. See Enabling Intel VT-x and AMD-V virtualization hardware extensions in BIOS in the Red Hat Enterprise Linux Virtualization and Administration Guide for more information. Enable the IOMMU flag in the kernel by selecting the Hostdev Passthrough & SR-IOV check box when adding the host to the Manager or by editing the grub configuration file manually. To enable the IOMMU flag from the Administration Portal, see Adding a Host to the Red Hat Virtualization Manager and Kernel Settings Explained in the Administration Guide. To edit the grub configuration file manually, see Procedure G.2, “Enabling IOMMU Manually”. For GPU passthrough, you need to run additional configuration steps on both the host and the guest system. See Preparing Host and Guest Systems for GPU Passthrough in the Administration Guide for more information. Enable IOMMU by editing the grub configuration file. If you are using IBM POWER8 hardware, skip this step as IOMMU is enabled by default. For Intel, boot the machine, and append intel_iommu=on to the end of the GRUB_CMDLINE_LINUX line in the grub configuration file. For AMD, boot the machine, and append amd_iommu=on to the end of the GRUB_CMDLINE_LINUX line in the grub configuration file. If intel_iommu=on or amd_iommu=on works, you can try replacing them with iommu=pt or amd_iommu=pt. The pt option only enables IOMMU for devices used in passthrough and will provide better host performance. However, the option may not be supported on all hardware. Revert to previous option if the pt option doesn't work for your host. For enabling SR-IOV and assigning dedicated virtual NICs to virtual machines, see https://access.redhat.com/articles/2335291 for more information. Copyright © 2018 Red Hat.